Sponsored by ACM SIGMM, SIGGRAPH, and SIGCOMM. 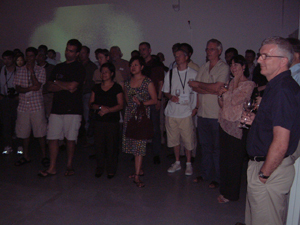 The ACM Multimedia Interactive Art Program 2005 took place in Singapore on Nov. 6-11, 2005. 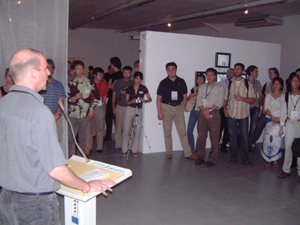 The art program included long and short paper presentations, and research-art jams at the ACM Multimedia conference [list below]. 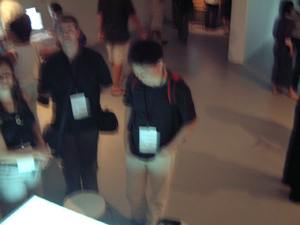 The exhibition at LASALLE-SIA College for the Arts, which was open to the general public, consisted of a wide range of works using various techniques and creative approaches at the intersection of multimedia art and technology [descriptions below]. In addition to an engaging performance (Body Degree Zero at the exhibition opening reception), demos, talks, and discussions, there was a strong social component as artists and researchers explored all the possibilities, at the beach banquet, and at other venues throughout the city [pictures below]. 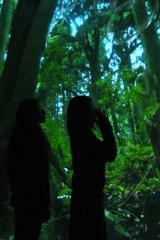 It was a blast. For centuries, artists and philosophers have explored the notion of presence from multiple perspectives, considering its physical, psychological, and cultural dimensions. 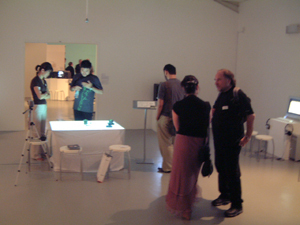 In that exploration, technology has played an important role, not only in the development of the tools used for the �grepresentation�h of presence, but also in defining it: from the revolution in painting brought by photography, to the new concepts of presence brought by technological advances in the last sixty years (virtual reality, telepresence, immersive presence, experiential systems, etc.). Such technologies, and in particular those that combine multiple media (video, images, computer graphics, audio, haptics), seem to increase �gpresence,�h questioning our embodied, singular sense of being in this world as the only way of positioning ourselves. 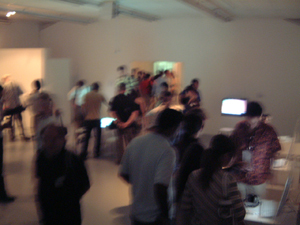 That questioning is closely linked to cultural, social, and economic factors: presence can be used to reaffirm power or control structures; it can multiply our sense of being by erasing distance barriers and allow us to take on new, virtual identities, or it can be interpreted as leading to absence as in the belief in some cultures that photographs steal the soul. Artists have worked with �gtechnologies of presence�h (e.g., image, light, reflection, emotion), in traditional art for a long time. However, while the rapid spread of technology has brought unprecedented changes in the very basic notions of presence (�gbeing there�h can be interpreted as being �gon-line�h), advances in transportation have lowered costs and changed the physical landscape: those with enough resources are able to travel to be �ganywhere�h in short periods of time, and opportunities for the less fortunate have also opened up, allowing the unprecedented movement of people creating great challenges for humanity in the 21st century. In the scope of these new challenges and opportunities, we selected inter-disciplinary works that address the issue of presence both in artistic and technological, but even more, in political (migration, home, sense of belonging and identification) contexts. Note: each work has a 2 page publication associated with it which describes motivation and technical details. Most papers are available at the artists�f websites. 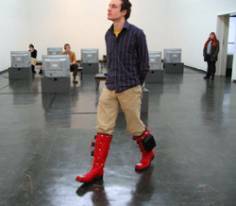 Artists try to represent existence and indicate the meaning of presence by a variety of practices. However, when a figure is created by bits and composes hyper-real information, the existence information has become fragments of fake existence. Presence has become a form of absence. Absence has become a form of presence. 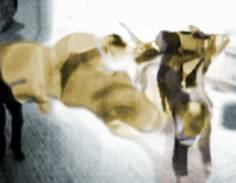 The work �eImmersing ME�f is an interactive art work inviting participants to perceive the process of dissolving from presence to absence. 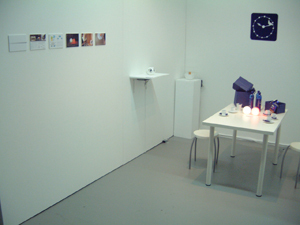 Tangible Weather Channel is a sculptural apparatus that enables the participant to input the remote location of a loved one and interprets its real-time weather information as a way of creating an emotional connection. 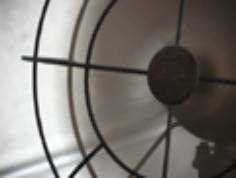 Rather than employing traditional graphical representation, Tangible Weather Channel renders weather information into a multi-sensory experience by using natural elements such as water, air and sound. 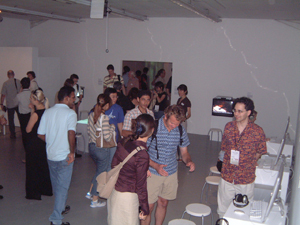 By materializing weather dynamics on intimate sites to mediate what occurs in another place, Tangible Weather Channel encourages the participant to establish links with his/her experiential memories of a specific place and to create a sense of closeness to via touch and contemplation. Human voices are invisible and easy to forget, yet I often have the feeling that voices are tactile and occupy a certain space that I want to artistically represent as various volumes or solid shapes. I created "KODAMA" to demonstrate my sensation of solidified human voices in conversation. This work enables me to demonstrate to an audience the existence of "voice" as a physical object and how it floats through space. The work creates a world by capturing voices of the visitors to the installation and representing them as bubbles in a forest. 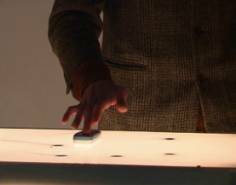 Non_sensor is a digital art project that makes use of a Polhemus motion tracking system to create a electromagnetic field which is disturbed by metallic objects that are manipulated by the visitors in the installation. This disturbance is interpreted by the system as movement, and presented in the interface as lines that create trajectories according to the distortions. 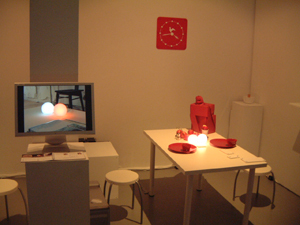 Visitors can therefore design different graphic patterns in the interface by playing with objects. This work subverts a magnetic position-sensing device using everyday electrical or metallic objects as impromptu tools of artistic expression. 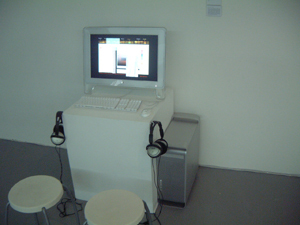 �gTastes Like�c�h (a composition for two monitors, mixing board and human body) is an interactive audiovisual work implemented without computers and common sound/picture - synthesis/processing techniques but exclusively with low-tech analogue equipment. 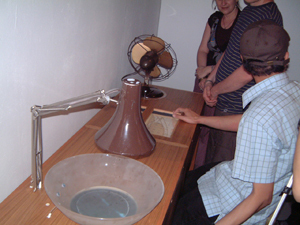 Basically it can be perceived as a new instrument, representing a product of creative misuse and combination of objects mentioned in the subtitle. 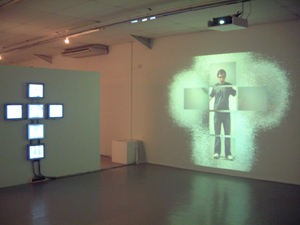 The monitors, mixing board and the player�fs body are connected in a specific constellation, which causes an audiovisual feedback, activated only through the presence of the artist and controlled by the location of his body inside the two dimensional, electrodynamic field, created by the two right angle positioned monitors. 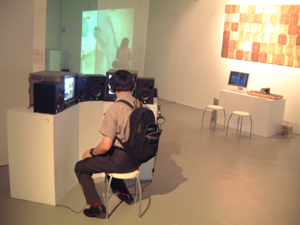 The work does away with technology altogether�\the body itself serves as a conductor of electrons to generate audio-visual collages. 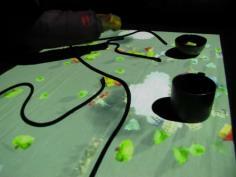 Diorama table is an interactive table installation. 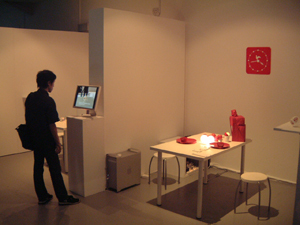 People place physical objects on the table and projected elements such as trains, cars, houses, and trees appear and are interacted with physical objects. Ere be Dragons, a collaborative project between artists and health scientists, uniquely combines live heart-rate data and location-awareness in a pervasive game-like artwork. 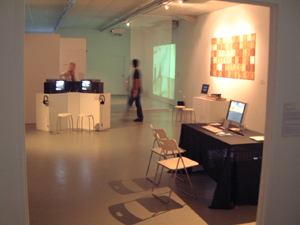 The emerging audiovisual map, created by the player�fs actions and presented through a Pocket PC, responds to their journey through the physical world and to the state of their body. 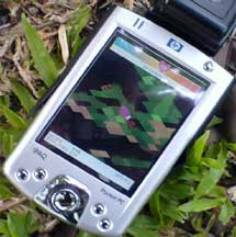 It generates levels of meaning by visualising the playe�fs personal physical involvement in their journey through the landscape, building traces of their action in the environment. 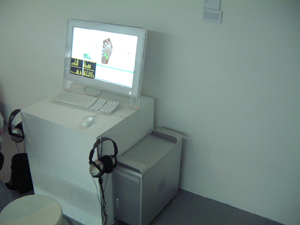 The project was supported by the Wellcome Trust SciArt programme. 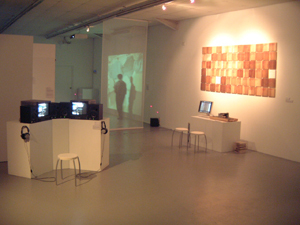 Impossible Geographies 01: Memory is an interactive installation in which memory becomes the metaphor for the fluid boundaries between the physical and the virtual. 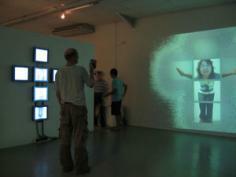 It dynamically traces visitors�f actions and mixes them in unexpected ways with memories captured by the physical space. Threaded with a network of laser beams, the space encloses a series of implied and shifting geographies, signified and made �etangible�f only by beams of light. When crossed, visitors trigger a fracture through which memories can seep into the physical present, creating a virtually woven fabric of events that grows and evolves over time. The Bomar Gene is a new media, digital fiction hybrid that explores the speculative concept that within us, the codes governing our bodies, is a single unique gene. This gene gives each person an individualized ability, a singular talent. The work's nine sections chronicle through ficto-biographies how these abilities separate/isolate us from our cultural/physical landscape. With each story and the accompanying interactive elements, the project explores how these genetically derived abilities consequently adjust our internal and external geographies. 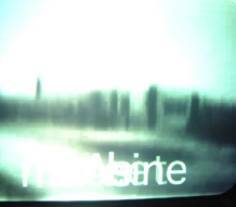 Through game, video, sonic and interactive interfaces, the ways these genes both locate and dislocate the characters are recreated/translated into aesthetic hypertexts. This project isn't as much about the science of genetics, as it is about human attributes and how those talents and internal deformities, reconfigure our relationship with "where we are". The installation The King Has... grew out of a desire to explore the ways in which people react to knowing the secrets of others, and if anonymity were guaranteed, the kinds of secrets people would choose to make public. 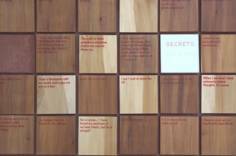 Secrets were gathered from individuals via SMS messaging, printed on wood panels, and mounted at two installation sites, creating ever-growing fields of text. The concept of �gSmallConnection (abbr. 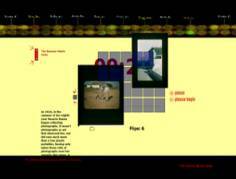 SC)�h is creating easy to operate tangible media for communication over networks. 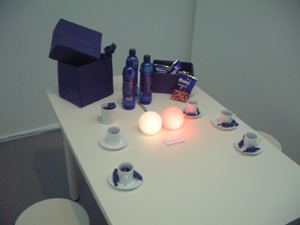 Focusing on the scenario where two intimate people live in distant places, we developed communication media that can be handled like tools, and can convey faint information such as light, wind and touch through the use of a robot technology. 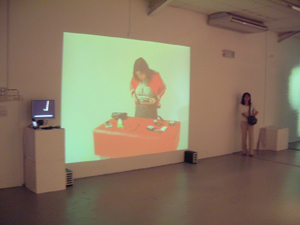 The goal of this project is to propose and prototype new media design for communication between two people. 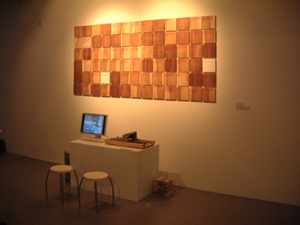 Through working 3 products derived from SC, we hope to widely propose a future communication design using multimedia. The Einstein's Brain Project is a collaborative group of artists and scientists who have been working together for the past 9 years. A central aim of the group is the visualization of the biological state of the body through the fabrication of environments, simulations and installations. 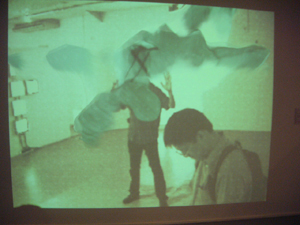 The Project has developed numerous installations using analog to digital interfaces to direct the output of the human body to virtual environments that are constantly being altered through feedback from a participant's biological body. 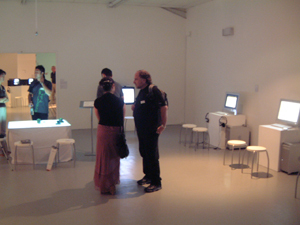 The core of the Einstein's Brain Project is a discursive space that engages with ideas about the constructed body in the world and its digital cybernetic and post-human forms. Vanishing Point is a presentation of the world as it responds to international newspaper coverage – not a measure of what the world is, but of what is most newsworthy. Consequently, countries that receive less media coverage gradually disappear from view. 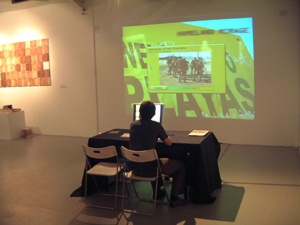 It consists of an interactive world map connected to a database fed by international news sources, and exists both in the form of a website and as a physical gallery installation. The goal of this piece is to decipher the world that news media reconfigures and to observe if media coverage, or lack thereof, is creating a new cartography. 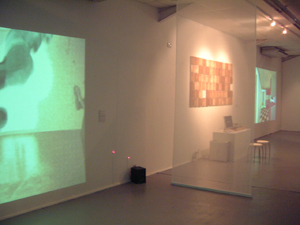 Interactions is an interactive multimedia installation designed and realized by the author. 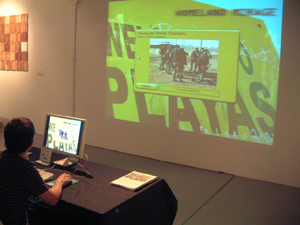 The installation utilizes two neural network artist agents that act as virtual artists to manipulate a body of images, texts, and sounds collected from the internet as directed by audience participants. The piece addresses issues including competition in the arts, machine learning in media, the role of popular acceptance in art, and the relationship between raw materials and style in creating media. Note: Long papers were presented at the main conference in three sessions. Papers can be obtained from the authors�f websites. 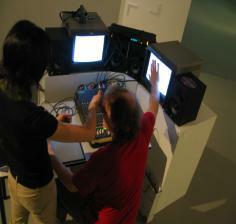 - Research & Art Jam #1: Can Artists & Researchers Play Mozart? - Research & Art Jam #2: Can Computers Dance? 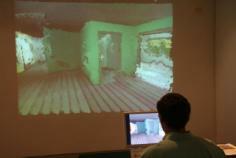 - Research & Art Jam #3: New Sensors, New Models: New Art or New Science? Note: short papers were presented at the main conference as posters along with the technical short papers. Papers can be obtained from the authors�f websites.